The Sikhote-Alin iron meteorite is one of the largest observed meteorite falls in history. 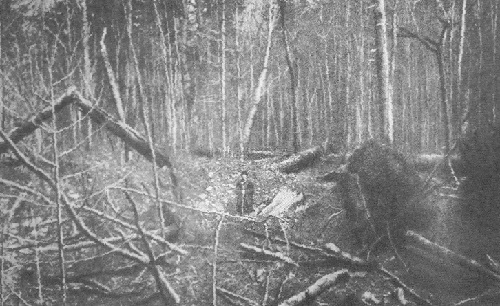 It rained a shower of meteorites and shrapnel fragments into the forest of the Sikhote Alin Mountains in Eastern Siberia of Russia on February 12, 1947 at 10:38 in the morning. The flaming fireball, moving from north to south and as bright as the sun, cast moving shadows in broad daylight as it passed by observers. It is estimated that over 23,000 kg fell that morning, leaving a smoke trail which could be seen in the sky for hours. It impacted in western spurs of the mountain range near the village of Paseka, about midway between Vladivostok and Khabarovsk. The debris field covered an elliptical area of 1.6 square kilometers. The meteorite impact resembled a huge explosion, and it was felt over 100 miles away. It created over 120 craters of varying sizes. The largest reported crater was 20 feet deep and 85 feet across. When the main mass exploded in an air burst at an altitude of about 5.6 km (3.5 miles), it blasted fragments in every direction. Pieces were even found embedded in nearby trees. Sikhote-Alin is classified as an iron meteorite (93% iron, 5.9% nickel), belonging to the chemical group IIAB and with a course octahedrite structure. It originated from the core of an asteroid formed approximately 4.5 billion years ago, coming from the belt of asteroids between Mars and Jupiter. The specimen owned displays numerous regmaglypts (indentations) created by ablation while falling through the atmosphere, and is approximately 2 ½” in length, and weighs 59.1 grams.